If you teach art to children, no doubt that you’ve come across a child who is unhappy with their work. Some children become rattled by a torn piece of paper or even a color choice. What can you do to help these children work through the sticky points of art-making? There is plenty of advice out there but sometimes the best way to help a child is to put yourself in their shoes. In today’s show, I share my philosophy and how I approach frustrated artists, what I say and how I help children enjoy the creative process. Mistakes are a part of art. As soon as we can teach children this concept, the more fun you will have as an art teacher and the more creative the students will be. I can’t say where children get this notion that everything must be done correctly, but it certainly resides in many children’s heads. So how do you see that mistakes are important to some children and that it’s not a reflection of you? It’s not easy, but I think it comes down to trust. I know my students. Well, the truth is, I often forget their names but I always remember their art and how they express themselves through it. I am gentle with my little kinders and first graders as art class might be their very first experience with art. I make sure I am in a relaxed state before they enter my art room because I want my energy to be positive and calm. Little kids can sense whether or not you feel they have made a mistake, so it’s important that you block it from your head. With older students, I am honest. If a child isn’t doing their best, I push them. I know many art teachers rarely offer comments or even praise, but I do. If you pay attention, you can tell pretty quickly whether or not a child is proud of her work. I build upon that notion, even if they did something completely opposite of what I taught. On the other hand, it’s just as easy to sense when a child is totally frustrated. A child might need encouraging words to push through an art project until it’s completed. This is hard for an eight-year old to understand. I can’t tell you how many times I looked at one of my pieces of art and grimaced at what I saw. But by working through the process, I sometimes found that in the end, the piece turned out better than I had initally thought. Frustration might be the emotional response but in some cases, a feeling of helplessness can result. If I sense this, I just cut straight to the problem. I’ll ask a few questions to see what the child doesn’t like about the painting and then we’ll brainstorm ways to fix it. Don’t assume that a child will be hurt because you recognize that the bear has five legs but only needs four. The kid wants to know how to get rid of the leg! Telling him that the bear looks fine, is often frustrating. I’m a creative thinker so we’ll come up with a couple of options for the kid and the kid will choose. And yes, I know what you are all thinking…what’s wrong with a five-legged bear? Nothing, but it’s not me that matters. It’s the child. Of course, finding solutions for one artist is tricky if you have 30 kids and five minutes left in art. You have to be quick. Offer good solutions and then move on. Not easy, but the more you teach this way, the easier it becomes. When doing a direct line drawing without pencils and erasers, tell the children to follow along as best they can. Even if they make a mistake, keep going. Then, when the drawing is finished, they can turn the paper over and begin the drawing again. Most kids will accept their first drawing because that’s when I bring out the paints. Most everyone will want to start painting. Manipulative? Maybe, but this encourages the kids to go with the flow and see what happens. They always love their work in the end. Rarely use pencils. 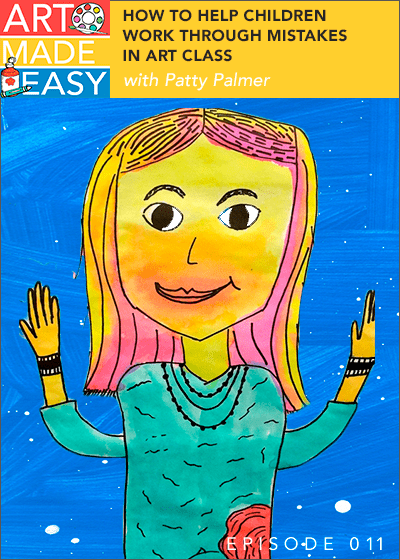 Start children in Kindergarten to draw with markers, crayons or oil pastels. The earlier you start with drawing this way without constant erasing, the more confident they will become as artists. Don’t get me wrong; pencils and erasers have their place in fine art instruction, but I think they are best left for older children. Here’s a tip I received from one of my readers and I thought it was brilliant. Have the children do a directed line drawing with pink erasers! The pink will show up on the white paper. The child can wipe away anything he doesn’t like. Cool, huh? For little kids, starting a drawing is the hardest part. Placing the eye of an elephant or the center of a flower can be hard. To help find the “right” starting point, have the child point to the perfect place on the paper. Once they receive a”thumbs-up” from you, they can make a dot and then begin their drawing. 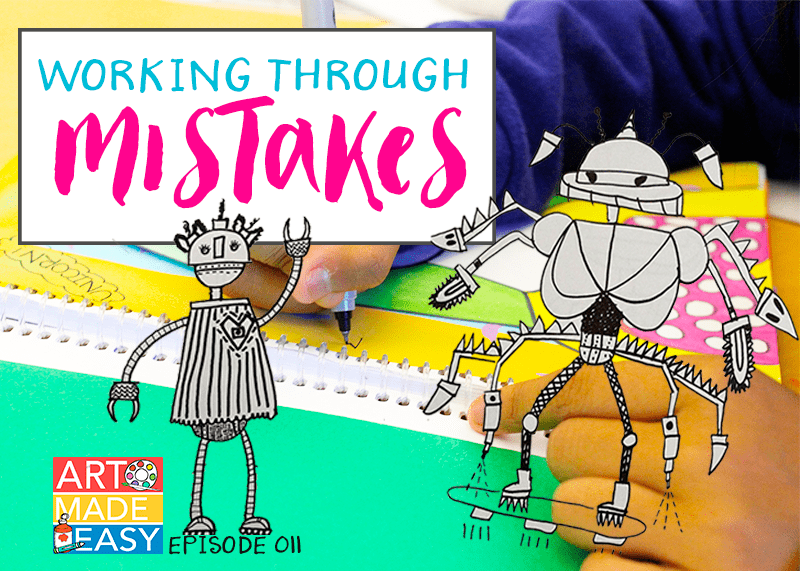 Working through mistakes is the hardest aspect in teaching art. But how children deal with it in art class is up to you. Make sure you have your head in the right place and believe in what you are teaching. I would love to hear how you help frustrated artists in your classroom. Share your thoughts or tips so that you can help other teachers impact children with their love of art. Leave your comment below. Did you find this episode helpful? I would LOVE if you would leave a review on iTunes. Just click HERE (click the blue box that says “subscribe in iTunes”) and let me know what you think. By reviewing this show, you are helping me reach more audiences by telling iTunes that this show is relevant and helpful. Thank you so, so much! This year I read Beautiful Oops to my kinder class for the first time ever. 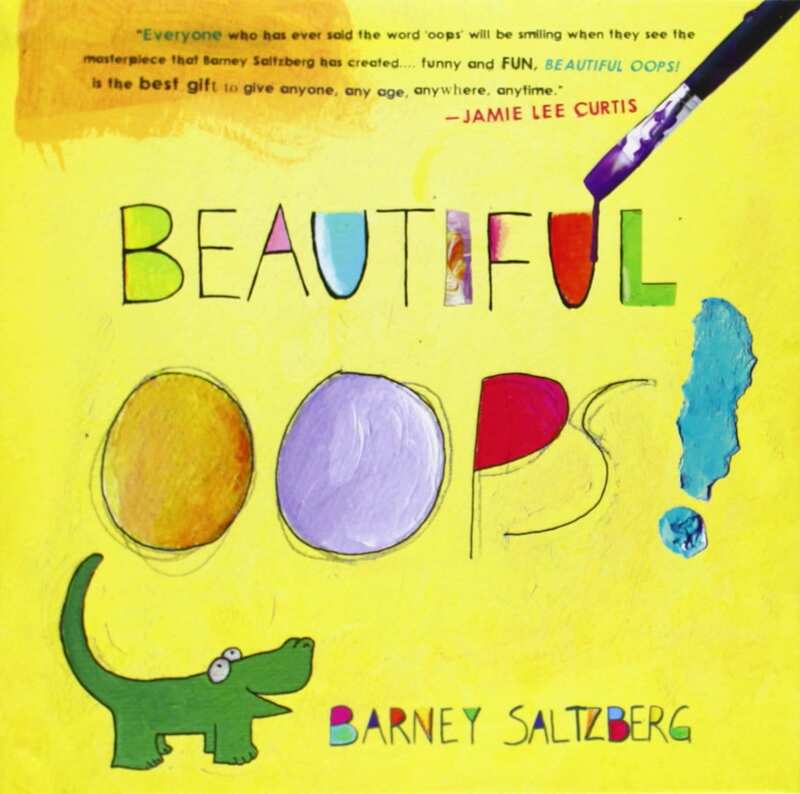 Since reading it, when someone tells me they made a mistake, I ask “What would Barney do?” (Referring to the author of Beautiful Oops. ) Then we have a great time thinking what Barney might do with this “oops” and soon the child is laughing and walks away ready to carry on. Wow! You always seem to hit the mark. My gratitude can not be fully expressed via email. As a volunteer art teacher who has written a program and run it for past several years. I have run into this situation many times. It is often what keeps me going. Is there any greater reward then the success of a child? That light bulb moment. Each age group is different. In 7/8th I keep a watchful eye. In 4th this year I have called upon art elements as suggestions. I try minimal approach. Struggles are a part of art, overcoming those struggles, and successful projects are rewarding to watch. I often find a child that unlocks the struggles often creates the best project. Each situation is different. I try and read the situation and keep a watchful eye. Sometimes space is needed and other times encouragement is the key ingredient. As a homeschooling mom, I have found that the artwork my kids have created brings me more joy than I could imagine! It’s as exciting to me as listening to words being sounded out for the first time or math facts being mastered. Your blog has been a huge inspiration for the projects we’ve done, so thank you! And thank you for this podcast. I am a bit embarrassed to say that recently I was the one getting frustrated when my kids “derailed” a project. We were using cardboard pieces of different shapes to make buildings and then the buildings turned into people, with hair and eyes. I had in my mind these awesome buildings they would create, when instead they made hilarious people! I am encouraged by your advice to celebrate the creativity that occurs when kids think outside the box and to not be too rigid. Just the encouragement I needed! Hi Patty, as I told you many times before I do love your work, it is easy to duplicate and the children love it (it’s child proof). Thank you for all you do. 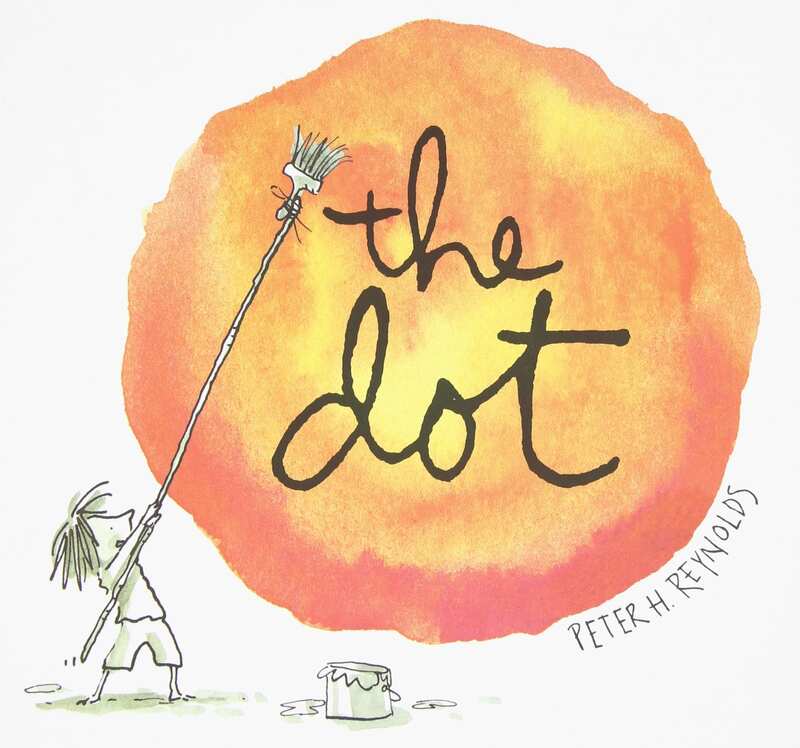 The way I try to deal with the little perfectionist in class is by reading The Dot at the beginning of the year (I teach K-8th and they all know that I will read that book along with classroom rules every single year). It is a kind way of reminding them that anything could become art, and if they make a “Mistakes” they can incorporate it as part of their final design. I do have a second grader that struggles with perfectionism and while doing portraits he could not get pass the eyes because he had made “a mistake”, and they were not the same sizes. The minute he complained about it a little girl across the room shouted …”there are no mistakes in art” …but he was totally frustrated and had shut down so I went over to see what the fuss was all about. I explained that he had already followed all the instructions given and now he could have fun by making his own designs, even if he wanted to make it abstract, I just said think about it and call me if you need more help. I walked away and kept my eye on him, he was almost in tears, but within minutes, he had a big smile on his face and showed me how he had given himself sunglasses (and boy, was he happy). And of course, you know what happened next, all 6 boys in the class gave their portrait sunglasses because that looked so cool! I don’t know if this is the correct approach but I feel that they become problem solvers and their little souls are free to create fun art during those weekly 45 minutes of class. And, I have to say that I do get some amazing artwork! Beautiful Oops changed our focus forever! After reading the book each student is given a premade Oops paint splat. By the end of the class students are having so much fun making Oops critters that some of the fear of mistakes is tempered. Sometimes all we need to say to a frustrated artist is “you have a beautiful oops” … It seems to give them confidence to look at it differently. We also try to emphasize how many many pieces famous artists discard before they have even one that they put in a gallery. If a child complains that he/she hates the piece we try to find out why and then ask what part they do like…. And remind them that art sometimes goes thru ugly to get to beautiful! We have tried to be hands off with making changes on the students art but always have scrap paper to show ways to make changes. I loved that you also talked about gently pushing those who need to be pushed or giving choices … It’s never one solution is it? Thanks so much for this dialogue. I keep several of my pieces I made in undergrad art courses. Two are my “messed up” pieces. One is now living a life as a pen holder, the other sits on the windowsill as a reminder. Both were made in a ceramics class I took in undergrad for fun. Both didn’t meet the teacher’s requirements for the lesson. We were to make a cylinder form that was perfectly smooth & a smooth box form with a lid that fit perfectly. With the cylinder, I realized too late that I rolled out my clay too thick. As I rolled my clay up in a cylinder, it kept falling down. In an effort to thin it out before anyone noticed my mistake, I used my thumb to push up the clay. My teacher came by, he applauded me for thinking outside of the box. I apologized for not getting it exactly like the assignment. He said I didn’t need to appologize, and showed me how to add to the ridges I created. The box form, I struggled with smoothing out the lines (all the other students were creating beautiful boxes around me) and getting everything smooth & fitting together. I had a bad day in my other classes & that one was the last straw. Tearfully, I liberally hacked away at the sides of the box, leaving deep, jagged gouges, feeling like a failure next to all the art students. My teacher came over and examined my box a few minutes later. He was thrilled at the emotion I put into the box. He encouraged me to do the same to the lid. He said he didn’t care if it wasn’t fitting, it showed deep expression. So much that he chose it to display for the entire art building. When a child in my class says he or she can’t do it, they made a mistake, I pull out one of the two & let the child hold it. I tell them the story. They usually calm down and try again, and we look at the mistake as an opportunity to make a better piece of art. Especially since they see I made mistakes and turned them into better art. As an almost forty-year-old aspiring art teacher (I’m a little late to the party) I recently discovered your wonderful podcast and this one in particular reminded me of myself…I am a metal worker and welder and I have thrown “tantrums” in my shop over projects that have gone wrong, haha. It is something about the creative mind when we visualize something so vividly yet fail to produce our ideas. I find this frustrating and facinating at the same time. I believe it is what keeps us innovative! Thank you for sharing your knowledge and experience!!! When I have my “Beautiful Oops” lesson we talk about it needing an artistic imagination to figure out what to do with the oops. We play the blob game, where one person makes a shape on the paper and their partner turns it around and around and makes something out of it. Then the partner makes a shape. Repeat. They love having an artist’s imagination. I make it a habit when I’m making art in front of kids and I do something I don’t like, I basically think out loud, “Oh, I don’t think I like that. Hmm…I think I might try ____.” I’m an artist and my son also likes to draw little detailed drawings, he prefers drawing to painting, and he fills all his sketchbooks and mine with his drawings and he’s pretty skilled, but he gets REALLY frustrated when his drawing doesn’t go the way he wants. He’s start sobbing with frustration and sometimes tears up his drawings. I remember my college art professor saying get rid of the image in your head. It’s okay to start with one, but it’s also okay to let that go so that your art can be something else. Like freeing your art! When I’m working on a painting at home, I casually talk about my painting, “I REALLY don’t like the way those trees turned it out. It’s bothering me. Oh well, I’m going to stop there and try again tomorrow.” Then when then when they see it next time, it might have changed the colors, or it may be totally different and they notice. So I guess modeling not getting so attached. That’s all I got!